Last year’s Battroborgs were a blast, but not without their quirks. Accuracy was not one of the tiny bot’s strong points, and moving or turning was an exercise in frustration. This year, TOMY decided to simplify things a bit, while adding armed combat to the mix. The resulting Battroborg Warriors wield swords and scythes, and ditch the dual-fisted controls for a more streamlined system that uses only a single accelerometer-based remote. Obviously, we had to swing by the company’s booth at Toy Fair to try our hand in a one-on-one battle against the reigning champion, Senior Brand Manager Tom Zahorsky. The first thing we learned is that you’re no longer simply trying to make repeated contact with your opponents face. Instead, battles are won by toppling your foe, which is easier said than done thanks to their broader base and lower center of gravity. The improved stability does make it easier to turn your warrior, which is accomplished by flicking the controller in the same direction over and over again. It’s the same premise as the previous version, but it’s a little less fickle and instead of throwing a full punch, the bot nudges itself gently in one direction or another. Fuller swings with the controller, which is shaped like the hilt of a katana, launches your warrior’s attack. Our red cyber samurai took brutal two-handed swings with his blade, turning his whole torso into the blow. While Zahorsky’s purple and black ninja wielded dual weapons that he used to pummel us into submission… repeatedly. When a “g-sensor” inside the combatant detects that it’s been toppled, it turns a light in the chest from green to red, to indicate its demise (though, that feature wasn’t working just yet in the early prototypes we played with). The single-handed controller simplifies the act of dueling, and even pumps out sound effects as you swing your weapon. Instead of 2.4GHz wireless, TOMY decided to rely on IR for controlling the Battroborg Warriors, though that doesn’t net you any additional play time — you’re still looking at 20 minutes of combat before needing to recharge. There is less of a chance of interference from cordless phones or WiFi, but you also have to maintain line-of-sight with your plastic avatar and only two bots can battle simultaneously. That means you can’t have a 20-person battle royale anymore, but the new arena packaged with the warriors isn’t exactly conducive to such an epic clash anyway. The smaller ring (with fewer options for customization) is designed to force confrontation, though it also had a tendency to trap our samurai in a corner with his back facing our opponent. One welcome addition is a pair of trap doors. If you strike a lever on either side of the board, it opens up a pit under your foe, leaving them vulnerable to a mortal blow. Battroborg Warriors should hit shelves in June across the US. 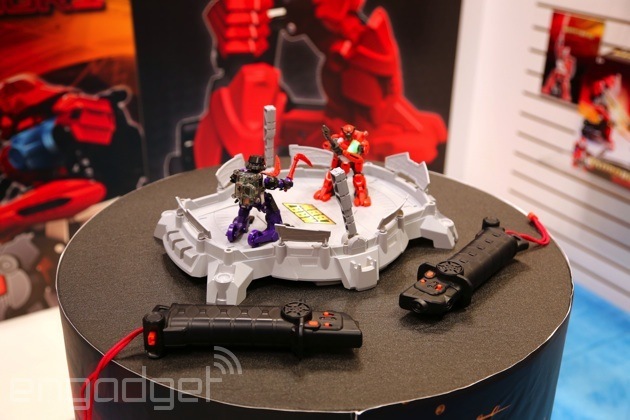 A package of two bots, two remotes and the arena will cost $70; while individual combatants will set you back $30. Edgar Alvarez and Daniel Orren contributed to this report.